Vietnamese libertarian socialist Ngo Van Xuyet's account of the repression of revolutionaries around 1945 by Ho Chi Minh's guerrilla forces. The coming to power of Ho Chi Minh in Vietnam in 1945 was favoured by the special conjuncture of circumstances in which the country found itself: the absence of the French imperialist state apparatus, disrupted by the Japanese army since 9 March 1945, and the surrender of Japan itself on 15 August 1945. Arriving at the head of his guerilla bands from the highlands of Tonkin, Ho Chi Minh took power in Hanoi. He was able to impose himself upon the insurgent masses not only by his reactionary nationalist demagogy but also above all by force of arms and through the murders carried out by his GPU, the Ty Cong-Au. Whilst the former mandarins, bourgeois, landlords, peasants and workers were being invited to participate in the Stalinist Vietminh front, Ho Chi Minh was asking the emperor Bao Dai to abdicate in favour of the ‘republic’ and to agree to become Supreme Counsellor/Advisor to the ‘democratic’ government. At the same time his assassination committees were arranging for the ‘thorough’ disappearance of the printer Luong Doc Thi, the leader of the Thanh Nien Thothuyen Xahoi (Socialist Worker Youth), Nguyen Te My and many other internationalist militants, including Tiep, Luong, Vinh, and Sam, who suffered the same fate. Nguyen Te My had been organiser of the Viet Da Tuyen (Independent People’s Front) in the Haiphong area. The teacher Tran Tien Chinh was arrested and died from the effects of torture in [illegible] prison at [illegible]. Just as Ho Chi Minh was occupying Hanoi, the miners of Hoa-gay in Camphu district (a conurbation with a population of 300,000) rose in revolt, set up workers’ committees, and on that basis established a truly proletarian government. The workers took over the mines, tramways, railways and telegraph system, arrested the bosses and the police, and destroyed the local apparatus of the old imperialist state. The Japanese troops, who had surrendered, remained indifferent to the situation. All the means of production were placed under the direct control of a management committee elected by the workers themselves and completely controlled by them. The principle of equal pay for all levels of manual and intellectual work was put into effect. Public order was maintained by armed workers. During the three months of its existence (from the end of August until December 1945) this first proletarian government made mining production work normally, secured the economic life of the region, conducted an intensive struggle against illiteracy and brought in sickness benefit. But isolated by circumstances, the movement was unable to spread and rouse the other working class centres in the country. After having established himself in Hanoi and having murdered the proletarian revolution in that city, Ho Chi Minh sent for his armed gangs from the Delta under the leadership of Nguyen Binh (the future Commander-in-Chief of the guerillas of Cochin China) to surround the insurgent mining district and force the workers’ government installed there to dissolve itself. The workers’ militia had only a few rifles and sharpedged weapons, so a compromise was reached: Nguyen Binh’s troops entered the district promising to respect the status quo. Thereupon, by means of underhand police intrigues, the militants S, Lam, Bien, Hien, Le and others, who had been elected by the workers, were ousted from their positions, placed under arrest and taken to Haiphong, where several of them had to be released in face of the anger of the miners. But in the end the entire region was occupied and subjected to the military and police control of the Ho Chi Minh government. On 14 September 1945 in Cochin China (South Vietnam), this same Vietminh government arrested the Popular Revolutionary Committee at 9 rue Duclos that had been set up on the initiative of the International Communist League (LCI). This embryonic soviet had placed its stamp upon the region of Saigon-Cholon, Gia-dinh and Bien-Hoa. Bombarded by the general staff of General Gracey’s British troops of occupation, as well as the Stalinist Tran Van Giau clique who led the Vietminh government, it had advanced the slogans of arming the people, expropriating the landlords and handi over the land to the peasants, and for workers’ occupation of the factories. The Stalinist Minister of the Interior, Nguy Van Tao, sent soldiers to bring to their senses with bursts of machine gun fire the peasants of Go-den, as well as the peasants of the Plain of Reeds, who had themselves expropriated the landlords. Whilst Ho Chi Minh and his follow were advertising themselves as supporters of the ‘democratic’ (Russo-Anglo-American imperialist) ‘Allies against Japanese Fascism’, and whilst the Popular Revolutionary Committees were calling the masses to armed insurrection against all the imperialisms (democratic or Fascist), Tran Van Giau sent his police (those same cops who only yesterday had still been in the service first of French and then of Japanese imperialism) to dissolve the Committee, and its militants were sent the Central Prison in Saigon to be shot. When the British troops, whom the Vietminh government had but recently welcomed with a “Hurrah to the Allied Forces”, helped the French to reoccupy Saigon, Tran Van Giau and his gang fled to Cho-dem, leaving the revolutionaries locked up in the hands of the French police and the (British) intelligence service, whilst the popular insurrection, against the wishes of those in flight, erupted against the Franco-British troops on the night of 23 September. The Vietminh GPU continued to hunt down the revolutionaries on its blacklist even whilst in flight. The leading members of the Socialist Workers Party of Vietnam (whose leader Ta Thu Thau had been murdered on Ho Chi Minh’s personal orders in September 1945) Tran Van Thach, Nguyen Van So, Nguyen Van Tien and many other workers were murdered at Kien-an (Thu-dau-mot) on 23 October 1945; Phan Van Hum and Phan Van Chanh ‘disappeared’ somewhere in the areas controlled by the guerillas in the north of Cochin China; Nguyen Thi Loi, a member of the same party, was murdered at Binh Dang (Cholon) in October 1945; Le Ngoc and Nguyen Van Ky, members of the LCI, were tortured to death by the GPU of the Vietminh in the Hoc-món region at the beginning of 1946. This marked the end of the period of simple murders and of the ‘execution of traitors’, and was the beginning of the period of the ‘Moscow Trials’. Having already escaped from Ho Chi Minh’s GPU in 1945, Nguyen Van Linh, known as Rene, and Truong Khanh Hinh, two revolutionary workers from Saigon, fell into a trap laid by the Vietminh in May 1950.1 Nguyen Van Linh had taken part in the European workers’ movement since 1930 as an activist among the circles of the Left Opposition in France. Having returned to Indochina at the beginning of the war, he had been a member of the LCI from the time of the Saigon Uprising of September 1945. 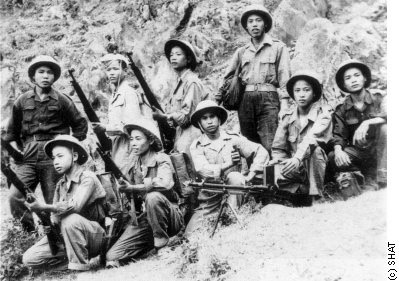 He had been one of the organisers of the Go-Vap Tramway Workers’ militia (whose leader, Tran Dinh Minh, known as Nguyen Hai Au, had died in battle with the French troops on the Cao-Lanh Front). Arrested by the GPU of the Vietminh in 1946, he had escaped from Soc-Trang and returned to Saigon. Last year, having been invited by the guerillas of Bien Hoa to discuss a proposal for a so-called ‘United Front’, Nguyen Van Linh and two other comrades were treacherously arrested. When his wife went to search for him, she too was detained by the GPU. They bound her feet and suspended her from the rafters. Then they made cuts on her limbs with a pen-knife into which they put oil-soaked wicks of cotton, which they set alight to force her to counter-sign a statement allegedly signed by her husband. According to this statement, Nguyen Van Linh had confessed to having been an agent of the French Deuxieme Bureau, and to having received 31,000 piastres from Bazin, the Security Commissioner, for use against the ‘resistance’ movement. His wife, who was being held separately, saw him and hardly recognised him; he was a mere human bundle of rags. There is no need to dwell on the fate that awaits him – if he has not been shot already. The two other comrades have already been killed. Nguyen Van Linh’s wife escaped from her torturers in the middle of a battle between them and the French troops. Ho Chi Minh and his GPU are marching in step with the Bao Dai regime and the French expeditionary corps as far as methods of torture and murder are concerned. The only victims are the oppressed and exploited masses and those who constitute their revolutionary vanguard. Whilst the American imperialist bloc, hand in hand with Mao Zedong, puts Korea to fire and sword and makes intensive preparations for the destruction of mankind with its atom and hydrogen bombs, Russian imperialism, by means of its hired assassins in every corner of the globe – in China, in Central Europe, and in the guerilla areas of South East Asia – proceeds with the methods of the Inquisition, besides which all the Torquemadas of the Middle Ages pale into insignificance, to the total annihilation of what yet remains of those elements that are faithful to the world proletarian revolution, the movement for the liberation of mankind. The case of Vietnam shows that the Stalinists of the Asian guerillas are the equals of their masters in Moscow when it comes to monstrous crimes against the revolutionary proletariat. 1. According to Ch’en Pi-Lan, Looking Back over My Years with P’eng Shu-tse in P’eng Shu-tse (ed. ), The Chinese Communist Party in Power, New York 1980, pp.42-3, Rene and Liu, the two leading Trotskyists, had organised a conference in a zone controlled by the Vietminh army, the chief of staff of which in that area was a Trotskyist. But this was a trap prepared by the Stalinists, and they were all arrested along with the Chinese Trotskyist Lu Chia-Ling, who was on his way to Europe with Peng Shuzi and his wife, and so died in prison in Vietnam. Cheers for this EP, will give this a read soon.. looks really interesting.. It's "Ty Công-An" (which could be roughly translated as Police Department) not "Ty Cong-Au"